Toby Jugs, or character mugs, are an interesting type of collectible with a rich history in England that dates back to the 18th century. The inspiration for the Toby Jug likely hails from an old tavern song called "Brown Jug" which commemorates the life and death of the Staffordshire gent Toby Philpot, known for his drinking prowess (probably based on the real life story of a Yorkshire man called Henry Elwes who was said to have drunk 2,000 gallons of ale). 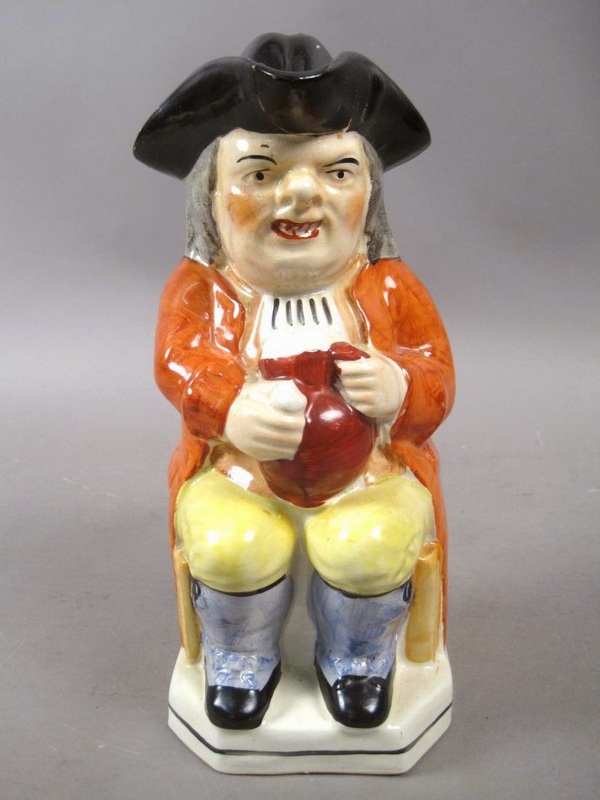 The song was popularized in 1761 when it was published with an accompanying illustration that became the basis for the traditional Toby jug figure: a round old gentleman holding a tankard of beer and thoroughly enjoying himself. Some of the earlier jugs (like the one pictured below) might have been used to carry beer to the table. This type of jug has a lid, disguised as Toby's tricorn hat. This sort of archetypal drinking gentleman mug is known as an Ordinary Toby. In the early 20th century, designers at Royal Doulton conceived of the possibility of reviving the old Staffordshire Toby jug: a tradition popular in the 18th and 19th centuries. The company expanded on the Staffordshire jugs by creating a series of character jugs based on English legend, history, literature, modern personalities, and music. These jugs were produced as a modern take on an old art form and included figures that would be most appealing to the up and coming generations. Vintage Toby jugs from Royal Doulton encompass a wide range of themes and motifs: Biblical characters (e.g. Noah), mythological characters (e.g. Neptune, Merlin, Santa Claus), figures from folklore (e.g. Robin Hood, Toby Philpot himself) or literature (e.g. Tony Weller from the Pickwick Papers, Robinson Crusoe, Rip Van Winkle, Falstaff), or historical figures and archetypes (e.g. Queen Victoria, Captain Henry Morgan, North American Indian, the Night Watchman, the Guardsman, the Lawyer, the Fireman, the Lumberjack, etc). The jugs tend to depict wonderfully evocative personalities with richly textured faces full of character. The faces range from kindly and avuncular (in the case of Santa Claus here) to weather-beaten and perhaps a little tipsy (as with our Lobster Man). A large single-owner collection of vintage Toby jugs (character jugs) by Royal Doulton can be found here. Or check out our store for more unusual vintage collectibles.